Thanks to the guys at Clearview Sunroom & Window, LLC for sending us some installation photos of a recent installation in Merrimack, NH. Pictured are the PGT Eze-Breeze windows in Bronze. Now the homeowner is ready to enjoy those cool fall days when the vinyl windows will come in handy until the morning chill wears off. 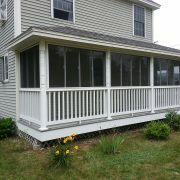 No more messing with temporary poly windows required for the NH winters…..just close the vinyl windows. Snow, rain, or dust…..whatever you need to keep out we can help. Call us today to place your order. 800-495-1833.